I wonder whether the intended parse might be [[end of city] limits], that is, the boundary defining the end of the city, rather than [end of [city limits]], which would suggest that a trajectory across the boundary (rather than across the city) has a beginning and a middle and an end. 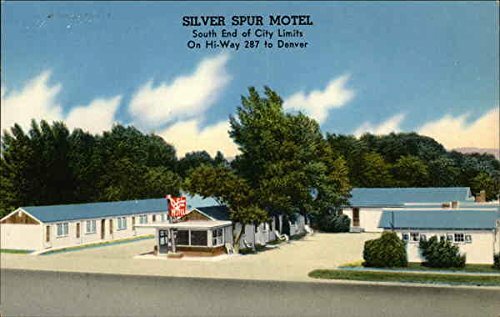 But maybe mid-20th-century Laramie (and Loveland) did have a sort of penumbra of urbanity rather than a crisply-defined edge. This doesn't bother me at all. In my mind I view "city limits" as an expanse, rather than a boundary: the city is the part with houses and stores, the city limits are that long stretch past the last gas station and before the tumbleweeds. Thus the end of the city limits is the actual line. I don't know if it's because the -s in "limits" makes it seem like a range. I suspect "[end of [city limits]]," but "[city limits]" is being used to mean "the area enclosed by the city boundary." In other words, "end of city" or "Now leaving Loveland." 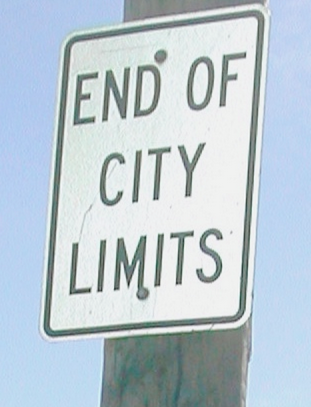 The same meaning as "[[end of city] limits]," but I think "city limits" is being used as a fixed phrase. It's an imprecise usage, but I'm having trouble thinking of a better way to phrase "The city boundary is here, and in this direction of travel, you're crossing out of the city" in a way that fits on a road sign and makes sense to people. 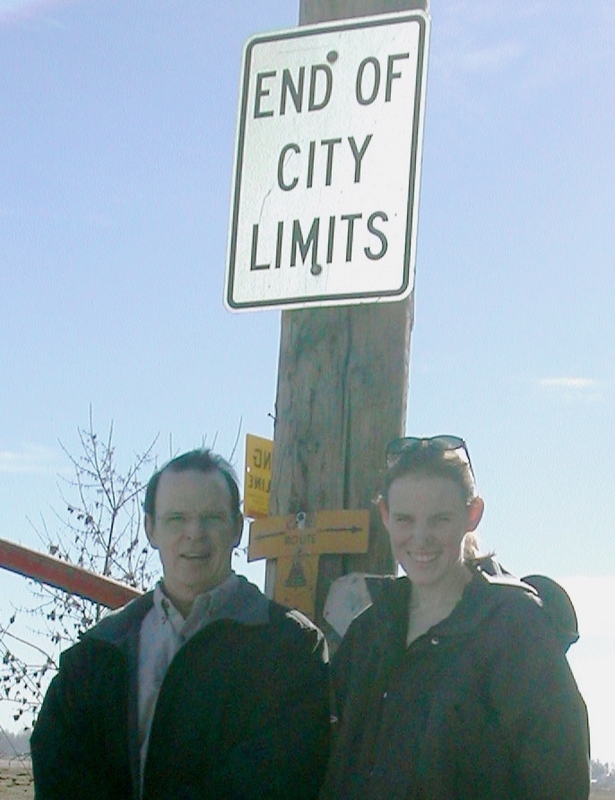 "End of city" doesn't communicate well enough that the sign marks the legal boundary of the city. "Now leaving [city name]" might, but you'd have to print different signs for every city. "Limit" means something subtly different to "boundary". A boundary is just an edge, but a limit implies confinement or restriction. The most common usage of "city limits" seems to be in the phrase "within the city limits" – which, superficially, is itself redundant, since "within the city" would appear to mean the same thing. However, when the term "within the city limits" is used, it seems more formal – there's usually a context of some kind of regulatory or jurisdictional differentiation between city and non-city areas. "Within the city limits" therefore seems to mean something like "within the jurisdiction of the city". I can see, therefore, how something apparently tautologous like "the city limits boundary" can arise, to re-emphasize the simple boundary aspect. ….and similarly – "End of City Limits" effectively meaning "End of Area under Jurisdiction of the City". Perhaps it's a political manifesto calling for the abolition of jurisdictional boundaries. Agreed with Caroline's interpretation. I also think it's a pretty reasonable way to convey the information clearly – every driver is going to intuitively understand what the sign is referring to even if it seems weird. This might be a good example of a usage where the most pragmatically unambiguous statement is semantically ambiguous. @Caroline: I just looked at a half-dozen or so web sites that sell road signs. None of them stocked "end of city limits" signs. A few offered "[city name] city limits" which seems pretty clear. In any case the extra cost for custom printing is fairly small compared to cost of the sign material and shipping. In other words, someone wanted that particular phrase at the city border and most likely had custom signs made. In California, and I believe in a number of other states as well, the usual sign encountered on entering the city limits says "city limit" (singular). I agree with the interpretation of "city limits" as "area under city jurisdiction" while the singular "limit" is equivalent to boundary. I just checked the Random House Kernerman Webster's College Dictionary, and it defines limits as "the premises or region enclosed within boundaries." The most unambiguous signage, it seems to me, would be "Leaving Loveland". However I see on Google Maps that Loveland has a rather irregular boundary with quite a few unincorporated areas within its "limits". Some roads cross out of and back into the city several times. So perhaps the intended meaning here is "Really leaving Loveland. Honest!" "This might be a good example of a usage where the most pragmatically unambiguous statement is semantically ambiguous." effectiveness is what matters. Arguably, "end of city limits" — doubling down on the concept, hitting people over the head with the meaning — is less likely to be misunderstood than "city limits." My first thought was that the city was named End Of. גבול in Modern Hebrew means "border," but in Biblical Hebrew it can mean either "border" or the territory defined by such a border. I'm guessing more languages than just these two must have words with a similar kind of overlap. I think the French do it best – just the city or town name crossed through with a diagonal line. You saw the same sign, without the diagonal line, as you entered the place, so the leaving sign is instantly understandable even if you have never seen one before and don't speak French. Musicians commonly refer to what is technically a "measure" as a "bar", a bar being the sign that indicates the end of a measure. I think there's a similar semantic development here. …and then the sign that indicates the end of the bar or measure is called a bar line. Same idea, isn't it, as "this is not the beginning of the end, but the end of the beginning"? Or for that matter, "the democratic wing of the democratic party", or "the baddest of the bad", or "creme de la creme"? "City Limits" as a region is totally unidiomatic for me. The sign shown in the post is comprehensible, but the text seems glaringly ill formed. However, I am not surprised, in retrospect, that other people see the term differently. The alternate interpretation of "city limits" at least explains why there could be a music program/festival called "Austin City Limits," a name which I had always previously found incomprehensible. In England we don't use the expression, to my knowledge, but I know it well from US songs and films. To me the meaning is perfectly clear and doesn't strike me as strange, but that may be precisely because I know it from a particular subset of popular culture, while it isn't part of my normal speech. On the other hand, it occurs to me that it might have some kind of legal force, which it is required to express in precisely that way. I mean that, beyond a sign with those words, whatever happens is not the responsibility of the town. On Spanish roads, a sign warning of wild animals exempts (at least partially) the local council and the landowner from responsibility if you hit a deer or a bull as it crosses. However, what John Finkbiner and others say suggests that this is not in fact the explanation. Santa Fe, New Mexico, has those signs. I've got a picture, but I'm not in N.M. now. I don't agree with Coby Lubliner's dictionary, and I'd like to see an example of that usage. Michael Carasik and Cuconnacht: Another English example of border-for-region is "watershed", originally the boundary of the basin, now the basin, at least in non-technical American English. Another is "epoch", originally a point in time, especially the point you start counting from (e.g., 1 AD) or the boundary between two eras. The OED says, "< late Latin epocha, < Greek ἐποχή stoppage, station, position (of a planet), fixed point of time, < ἐπέχειν to arrest, stop, take up a position, < ἐπί + ἔχειν to hold." I suppose these are related to container-for-the-thing-contained. Brett: It is or was common to site bars, nightclubs, etc., just outside a city's limits to avoid inconvenient ordinances. (Speaking of another thread, I think there was one called the City Limits near Urbana, Ill., or maybe its twin, Champaign.) I always assumed "Austin City Limits" was the name of such a club. Wikipedia suggests it isn't, but that might be what the creators of the program had in mind. What does the sign say on the other side of the road (entering the city)? I've never not known whether I was entering or leaving a city. Perhaps if there was a city limits bar, though…. David P: Sorry, I've forgotten what the signs say in Santa Fe. There have certainly been built-up areas with a lot of suburbs where I haven't known which suburb I was in and could have seen a "City Limits" sign without knowing whether I was entering or leaving. However, in those places I usually didn't care. I took a look at the city limit(s) on Google Street View. As you exit the city, the sign reads "Santa Fe City Limit Ends." Entering, it reads "Santa Fe City Limit Begins." In my own idiolect, "city limit" means the one-dimensional border, while "city limits" is the two dimensional area enclosed by that border. And the key included in the image David P linked to has the definitions of signs 106 and 107 as "beginning of city limits" and "end of city limits." Sign should read "Entering …..Whatever location…." Also, one use of the limit or line markers is to delineate maintenance boundaries, or to tell us who to complain to if we aren't happy with same. And of course, when police were theoretically not allowed to cross certain jurisdictional lines, this demarcation may have given some miscreants hope if they could see it. Dave W.: Thanks, that sounds familiar, and I should have thought of Google Street View. I'm surprised that no one here has mentioned what I think is the most likely meaning of this sign: it indicates the end of the city SPEED limits, i.e. on one side of the sign the speed limit is the "city" limit (likely 25-30 MPH) and on the other it's the "highway" limit (likely 40-50 MPH or more). Much of this discussion is initially puzzling to a resident of Massachusetts, where there is no unincorporated land. We don't have signs saying that you're leaving a city or town; they just tell you that you're entering the next one. David D. Levine: The speed limits don't change at the city limit of Santa Fe (and there are a variety of speed limits within the city). Wikimedia has galleries of photographs of city limit signs classified by country etc. I suspect it's the end of the default speed limits for the city, giving way to default out-of-city default speed limits except where otherwise posted. I suspect it's the end of the default speed limits for the city, giving way to default out-of-city speed limits except where otherwise posted. @Jon: Russia does the same thing too. As does Armenia, and Bulgaria, and Israel… let's just say that, until reading this post, I thought every country did these signs that way. It's kind of the natural way to do it, no? @OP: I personally have no problem understanding the sign as "end of [city limits]" meaning "end of territory belonging to the city". That said, I really like the idea proposed by David D. Levine and Gregory Marton (that is to say, that the sign refers to the end of the city speed limits, and the start of the more lenient highway ones). I've always been perplexed signs reading "Hill Blocks View," because isn't that the very definition of a hill– i.e. something you can't see through? amirate? Never mind. I just dropped in to see what condition my condition was in. This sign is also useless unless you know what city you just left. Also, seeing as I live in NJ where every acre of land is incorporated, there are almost no "End of city limits" or whatever signs. There is just a sign that tells you which municipality you are entering upon leaving the last one. The major exception is when you are about to get onto a freeway, which isn't really "in" the towns it passes through until you take an exit to get to one. The signs usually say "Leaving X", but Clark, where I used to live, says "Thank you for visiting Clark", which sounds kind of rude to the residents. This language becomes more understandable, though no less annoying, when you notice in the small print that the erection of the sign was sponsored by Shoprite (a major supermarket chain in the region) which happens to be just off the exit, and therefore an easy place to get some shopping done during your commute. @Al Schulz “Sign should read "Entering …..Whatever location…." ” this seems a bit rigorous, and not only for D. Parkerish places (“when you get there, …”). This particular sign is presumably put up by authorities of some description for the city concerned: I cannot see why they must tell you where you are going when you choose to leave. And as for “We already know where we are and when we encounter a sign that tells us we are Entering such and such a different place, then we know where we are going into…”, I am glad you know where you are – I frequently find myself uncertain even when I have got there (& even if I have Entered it in capital letters).